Religious tattoos include designs like Lord Shiva, Trishul, Third Eye, Damru, Shiva Snake, Mantra, Ohm, Gods, Religious Elements, etc. 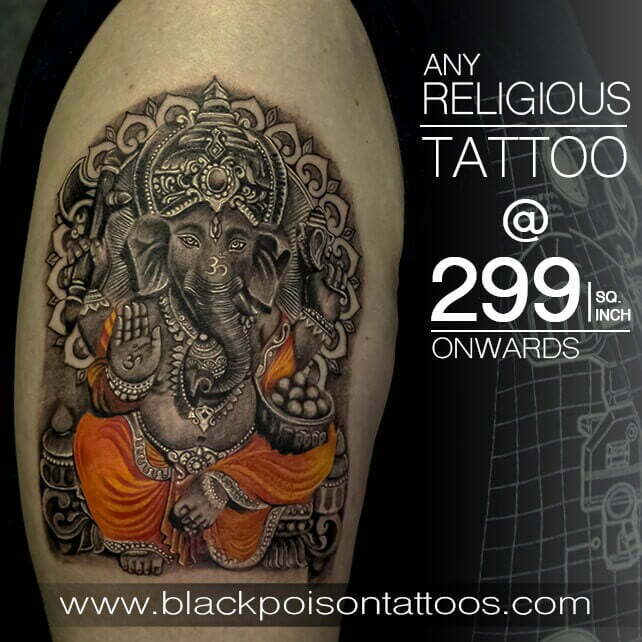 Valid on Stylish Tattoos like Portrait, Customized & All Types of Tattoo Designs in Colored or Black & Grey. Choose any type of Design. Rates will be 299 / Square Inch onward, Depending on the Size & Designs. This offer can be clubbed with “60% OFF” offer so rates will be 700 / Square Inch onwards. One voucher is valid for one person & one Tattoo. Appointment & changes are subject to availability. Print out of Order Email is mandatory. Providing the voucher code is mandatory before availing the offer at the studio. Multiple vouchers can be purchased as gifts. Cannot be combined with other existing offers. Redeem the voucher in a single visit. One of the Renowned Tattoo Studio in Ahmedabad City. All Artists are Certified & Professionally Trained & Experienced. Timings: 11:00 AM to 09:30 PM. Actual MRP Rates are 1800 INR / Sq. Inch for Black & Grey Tattoos and 2200 INR / Sq. Inch for colored Tattoos. Valid for Both Male & Female. New Needles Used for Every Tattoo. Needles and Tubes are kept Sealed in Sterile Packs. We Use Autoclave & Ultrasonic Machinery. Studio Provides a Personal Care Manual to help and Ensure that the Tattoo heals properly. An image is for representation purpose only. In case of dispute; Outlet management decision will be final. For a weekend visit, please book an appointment 2 Days in advance. Customers are advised while booking an appointment to inform that they would be redeeming a voucher at the time of the visit. It is recommended to carry an Email printout of the order email at the time of visit.